So intense. What does it mean? This entry was posted on Monday, August 23rd, 2010 at 12:00 am and is filed under Comics. You can follow any responses to this entry through the RSS 2.0 feed. Both comments and pings are currently closed. Ence better keep running double rainbows are very dangerous weapons and highly destructive to organic matter caught between them. As he so often is. Oh, he’s running from the rainbow. I thought he just hopped on frame, tossed out a double rainbow and left. I can’t decide if this makes the comic make more sense or not lol. Locke must be so used to all the stuff Ence does by now. I think Ence bought Lux. I know that I’m kind of late, but its kind of funny since Ense is annoying Locke and Locke plays LoL, because there is a character that has a rainbow attack now! 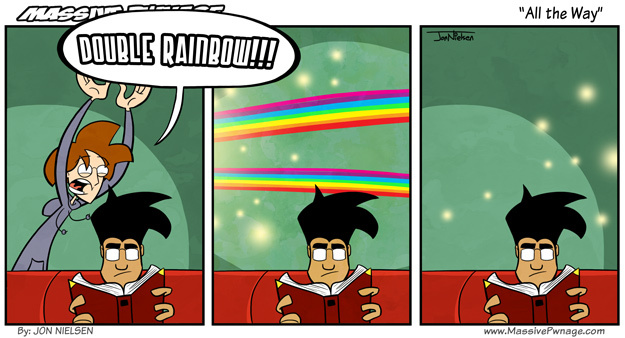 Yeah, I think Lux came out a month or two after this comic. She’s a very meme-tastic character.